These versatile labels can be used as favor tags as shown or cupcake toppers. 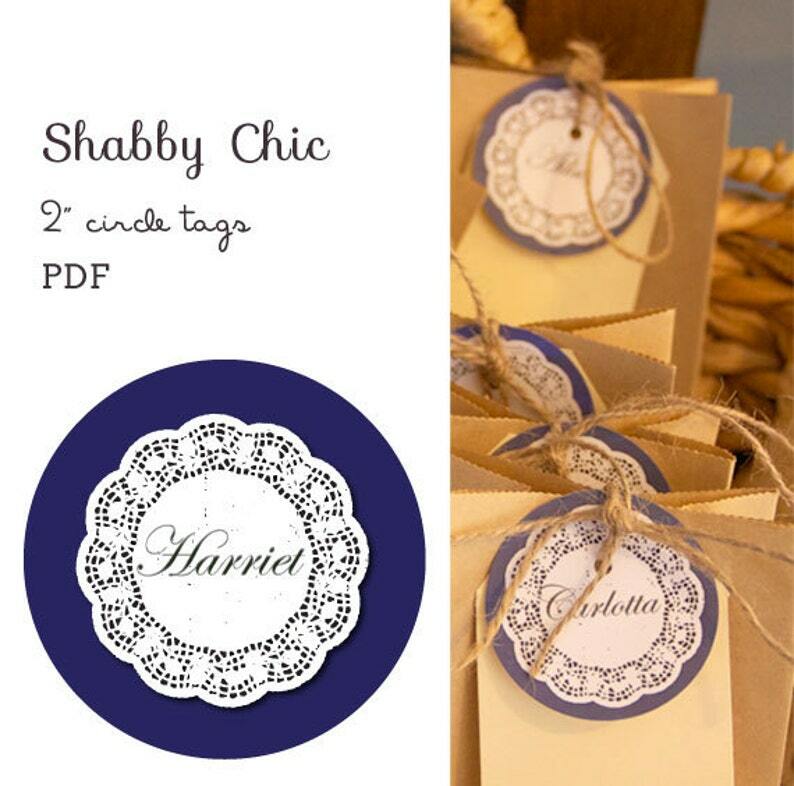 They are shabby chic styled with dainty doily backgrounds. Perfect for a girls birthday party, wedding or baby shower. The file can be edited as many times as you like for as many names or as many occasions as you like. 8, 2" circle labels on one sheet, with editable fields so you can add your own text. Please note luggage tag is not included but can be purchased separately and is part of the Shabby Chic range. Editable PDF file by instant download. No physical items are shipped. Please see shop policies regarding licensing. This file is for personal use only. You do not have permision to resell of redistribute it. You will fill in your own information into the file by filling in editable fields in the PDF. These files can be reused as many times as you like for as many occasions - just enter new text. You can even change the font for a different look! You can print your file as many times as you like or email the file to a print service provider and the text you imputed will be retained however you will not be able to save your edits in the free version of Adobe Acrobat reader this is only possible in Adobe Acrobat Professional. Detailed instructions on how to edit will be emailed with the banner artwork. Or convo me if you have any questions on how it works. Perfect!!! So happy to have all these printables in one place- so cool! Thank for the link to the font too! I have them all edited and printed on card stock- Could not be more perfect, ready to party!!!! Not as displayed in pictures. Harry Potter style font not an option. Very deceiving. Very good easy to use. If you aren't satisfied with your purchase then we're happy to refund the purchase price. We make every effort to make sure the designs are free of errors however they can slip through. Please let us know and we'll attempt to put it right for you and improve the pdf for others. Paper printables are for private non-commercial use only. You do not have permission to re-sell, re-distribute or re-use the artwork for commercial projects without contacting me first. Please be aware that colour varies from monitor to monitor and printer to printer. In most cases we provide a photo of the printed items and in most cases these have been printed on home ink jet printers to give an indication of how the actually printable will look. However we can not guarantee colours will match as we do not control the output devices. We aim to take custom orders where possible however this is dependant on our workload and the extent of the customisation required. Most simple changes, such as colour modifications, will incur an extra $3 charge however if the changes to the design are extensive the price will be determined on a case by case basis. We reserve the right to reuse any customisations to make new listings for our shop. If you want your customisations to be exclusive let us know when making your order and we'll discus an exclusive price.